I have a custom PCB to control a solenoid or DC motor. Input voltage 6-7 volts with 4 batteries in series. Why does the voltage drop by 1V to 1.5V when the switch is pressed to rotate solenoid or dc motor for 0.5 seconds? Can anyone explain and provide a solution so that it doesn't drop? I tried some non-rechargeable and rechargeable batteries. Almost all non-rechargeable batteries that I tried, the voltage drop was not fast or extreme, while every time I use a battery that can be recharged in one day the voltage drops so that the PC doesn't turn on. After I checked, out of 4 batteries, 2 voltages were in good condition, while 2 batteries dropped as they ran out of voltage. Could anyone explain and give the cause and what should I check? The internal resistance that I've shown as Rint can be as high as around 1 Ohm (depending on the battery cell). Please note that the load current drops some voltage across the internal resistance. When you measure the voltage of a battery, you place a few Mega-Ohms of resistance (i.e. internal resistance of the voltmeter) across the terminals of the battery. Thus only a few micro- or nano-Amperes flows through the internal resistance. This leads nearly no voltage drop across the internal resistance, so you measure nearly the actual voltage of the ideal battery. But if the load draws higher currents then these currents will drop some voltage across the internal resistance. Thus the measured voltage will be lower. For example, if the internal resistance is 0.5 Ohm (a fair value) and the load current is 1A then the voltage drop will be 0.5VDC. 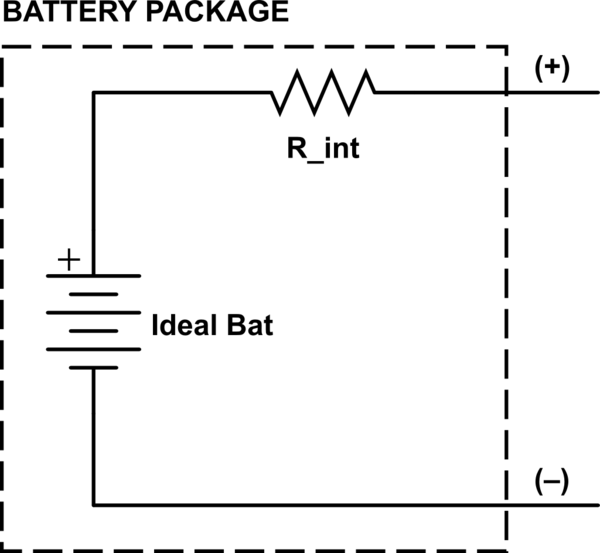 Thus the measured voltage of a 1.8V battery will be 1.3VDC. So the load will be supplied from 1.3VDC. The solution can be to use a voltage regulator depending on the voltage and current requirements. As Rohat Kılıç says, your problem is the internal resistance of the batteries. A simple regulator won't prevent the battery voltage from dropping. If you use a boost/buck type regulator, it could hold the voltage to your device steady - but it would have to be capable of providing enough current for your device and the motor. The thing is, that voltage drop is trying to tell you something: your load is too heavy for your batteries. Because of this, your batteries will not operate your device for very long. 1.5V batteries come in various sizes, from AAA to D. Try moving a size or two up. If you are using AA size batteries, move up to size C or D.
Put batteries in parallel. This will increase the current they can supply and reduce the resistance. The battery capacity also adds. Use only batteries of the same type. Use a larger battery. Say, a 6 V sealed lead acid battery or a 6V lantern battery. Ideally, you would measure the current that the motor or solenoid needs to operate. You could then look up the datasheets for various batteries, and look at the discharge curves for that current. That would show you the voltage drop and the expected operating time before you buy a set of batteries - it would save you time experimenting, since you can skip trying out batteries that have no chance. It is a consequence of the size of the battery. A small battery has less volume for the reactive chemicals, so it has less capacity to deliver current. Kind of like a small bottle has less volume than a larger bottle and so holds less liquid. A small battery also has less area for the plates of the battery. More area gives a lower resistance. Physics and chemistry limit the capacity and internal resistance of the battery. Not the answer you're looking for? Browse other questions tagged batteries battery-charging battery-operated low-battery custom or ask your own question. Why does a weakened 9V battery show lower voltage but a weakened 1.5V battery doesn't? Why does battery voltage drop under load?